Bringing On Thirty. So What. I was wondering on and off this year what to make of the fact that OffWhite will enter into our 30th year in a couple of weeks. Half of me wants to celebrate it. The other half doesn't care. We started in February, 1985. I'm smarter now than I was then. Is longevity a virtue? Is it a unique selling proposition? Does OffWhite history have any meaning beyond ourselves, or, more specifically, should you - our client - expect something you can’t find from any other marketing firm in the whole wide world? The truth is, in this business, we have to renew ourselves every day. If we miss a day, it's likely that some new technology, app, social media tool or cloud-based solution will have entered our orbit and rained down more buzzwords to scare away the cats. None of this is new, but in our world, the rate of change has accelerated and our clients have gotten younger and more eager to deploy the next best marketing tool, even though they might not have the slightest idea why. It's our job to jerk the leash. New app? So what. Cost benefit? Show me. When it comes to the fundamentals of marketing – more specifically, marketing communications or marcom – the pathways continue to evolve, but the basics remain rooted in human nature. Thank God for that, or we would all spin out of control. We live amid a litany of passwords and platforms, of top ten lists and best practices, innovation and ideas within our own company and among our clients, most of whom are technology geniuses with important solutions to bring to market. Yet the business of explaining things - our business - remains as stable as our collective curiosity, an OffWhite prerequisite for coming to work. In thirty years, this fundamental need has remained constant. As I wrote several years back in my piece on Stranded Technology, there is no value in an idea that cannot escape the sawdust floor. Brilliant though a new product may be, someone has to explain it, lift it smartly and place it in context with the rest of the world, switch it on and help it illuminate our slice of the market, edge the competition, overcome ignorance and ultimately sell, sell, sell. Today, the sophistication of media places a heavy burden in the crafting of the message. Somehow, these messages must complement one another, a concept we understood thirty years ago, and one that permeates our business today simply because what we dreamed for is a dream come true- accountability in marketing. Around 1964, about the time I was emerging from an adolescent coma induced by J. D. Salinger's Catcher in the Rye (he uses the f-word five times in this book), Marshall McLuhan, the Canadian philosopher and visionary of communications, advertising and even the internet (more than 30 years before it was invented) wrote his seminal work Understanding Media: The Extensions of Man, wherein he coined the phrase "the medium is the message". Just think; he knew nothing of websites and social media, but he was way ahead of his time. Fast forward to today at OffWhite, where we are eager to talk of our digital marketing platforms, our integration with social media, our ability to explain things, and our passion to grow with companies who want to grow with us. The basics of what we do remain rooted in human nature. Amid the tools and technologies that have reduced our world to a global village (another phrase by Marshall McLuhan), the desire to innovate is strong, our need to learn is what drives our business, and our relationships among our staff and with our clients are the most important precepts to our proficiency and integrity in business and beyond. Here's what. We survived the first Mac, the internet and dot com revolution, the tidal wave of digital design and publishing, the false starts and spammers, the wannabees and fakes, and the logo police. Today, we've collected the best, most fundamentally sound team of no-nonsense writers, designers, programmers and project managers who have the sense to sort out what's important and what's a waste of time and money. Thirty years. At OffWhite, we're smarter than ever, and learning something new every day. I'm proud of us all. Communicating effectively with your target audience is paramount to repeat sales. Today you are faced with more choices than ever for spreading your message, including websites, banner advertising, social media, radio, television and traditional print collateral. Managing a consistent message across all of these venues can be a daunting, but necessary task to guiding prospects into buying behaviors. Buying behavior is defined as the steps leading up to a final purchase decision. 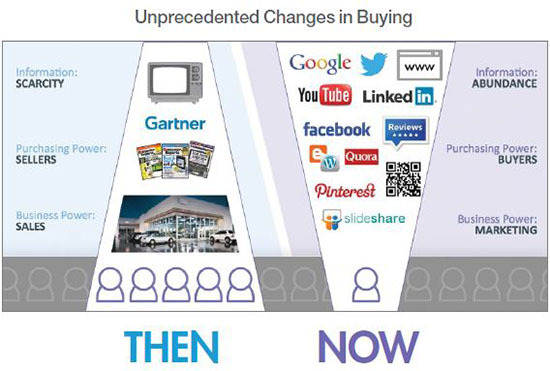 Consumer buying behavior has experienced a shift in focus over time as a result of widespread access to the internet and social media. Consumers now expect to be able to perform initial research on their own prior to interacting with a sales representative or visiting a store location. They look for detailed product information from your company, corroborated by the opinions and experiences of their peers. There has been an unprecedented shift in information availability, transforming information scarcity into informational abundance and placing the power of persuasion squarely in marketing messaging. As your informational footprint grows, the clarity and strategy of your message become even more important to ensure that your customers understand the unique benefits of your product over the competition. A multi-pronged, integrated marketing campaign with a unified, consistent message for a targeted audience increases the power of information and enhances customer interaction across all media types. 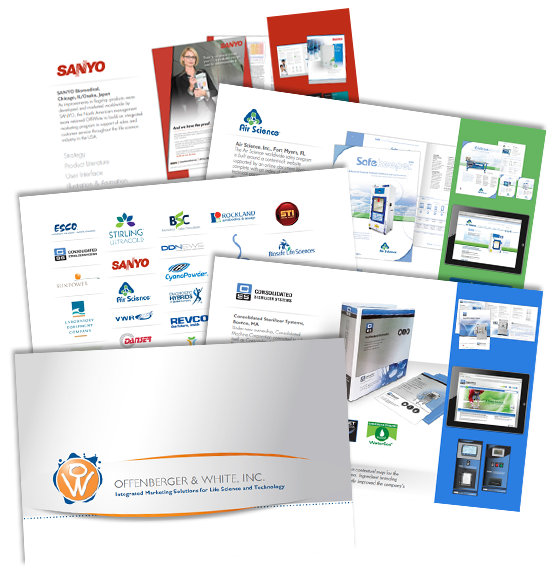 OffWhite has been crafting successful marketing messages for companies in the life science and technology market for the past 30 years. We integrate your marketing plan to incorporate social media, print collateral, web traffic and more, ensuring a clear, concise message that is consistent across all media types. To learn more about how we can help you spread your information effectively, contact Bill White at 800.606.1610. Your life science and technology marketing success relies on reaching potential customers where they live, and connecting with a valuable message that speaks to prospects on a personal level. Watch for these marketing trends this year. As more companies compete for attention, engaging and connecting with customers and prospects on a visual level will become essential. Infographics, animations, videos and other visual content use will increase, and will win business. Brands will work harder to customize messages and make interactions more personal. Content marketing surged in 2013, and is expected to continue to increase in 2014. Not only does content marketing help businesses attract and retain customers, great content makes for great SEO. Repurposing content for multiple campaigns is vital for a branded, integrated marketing program. Online ads will become more powerful, and harder to ignore, as they are integrated into content. Facebook’s News Feed Ads, Twitter’s Promoted Tweets and Buzzfeed’s sponsored content are just the beginning of this new trend to connect advertisers with interested customers. Video will be big for all of the leading social platforms in 2014. With talk of Google launching a video ad exchange program and Facebook's attempts at autoplay ads, you can expect to see more video ads on your favorite networks. Twitter's launch of its own insights will make it easier for marketers to determine their best tweets and adjust their content campaigns accordingly. If your website isn't accessible on a mobile device, search engines will begin to ignore it. All information that you share online this year needs to be cross-device compatible. Mobile traffic is at an industry average of nearly 30 percent, and it is expected to increase along with online orders placed from mobile devices. Search engine algorithms are constantly being tweaked to provide more in-depth results that answer searchers' questions. And searchers are using more meaningful long-tail search phrases - they're not just searching for "freezers" anymore. Most websites were built to portray the overall message and structure of the site through content. Newer semantic search techniques use HTML to emphasize the focus of the website, so review your keyword and meta data strategies for compliance to stay ahead of this subtle shift. Big data will be reduced to a path to purchase in 2014. As mobile users become more identifiable, and their behaviors are categorized, we will be able to focus in on the activities that generate leads and result in sales. 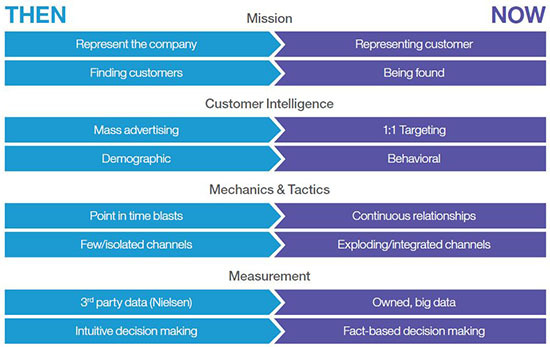 Attribution will redefine ROI and help brands get the most bang for their marketing buck. To learn more about how you can take advantage of these marketing trends, contact Bill White at 800.606.1610. OffWhite has earned a reputation in the life sciences and technology industries as one of the leading integrated marketing resource firms. No matter what you make or what services you provide to the life sciences, biotech, pharma and agribusiness markets, we have the experience to climb your learning curve quickly and with confidence. Our new viewbook highlights our work in the life science and technology fields. We have been fortunate to work with wonderful clients over our 29 years in business, and we look forward to a bright future with new and existing client relationships. To view more of our work, visit our website or contact Bill White. Designing, developing and maintaining websites is a large portion of what we do here at OffWhite, because we know that having a quality website is directly connected to the success of our life science and technology-based clients. Yes, marketing has to be holistic, and it’s necessary to invest in advertisements, promotions, campaigns, developing corporate literature, search marketing, etc., but when it comes down to it all of those efforts are pointing potential customers to a single place where they can find out more, contact you or even make a purchase – your website. Those in the life science and technology business sectors need to be very conscious of what their websites are saying about them. In this digital age, it’s where consumers go to get acquainted with your brand. This is where they learn about who your company is and how your products and services can meet their needs. Having a website that isn’t as clear and compelling as the trade publication ad or direct mail piece that led your prospective customer there to begin with is a sure way to negatively impact the perception of your brand and deter potential customers from converting into a lead or sale. Not only is your website a place for prospective customers to learn more about your brand, but it’s where they engage with it. Interaction is key to building relationships. The easier it is and the more opportunities there are for prospective customers to interact with your brand increases the likelihood of conversion. This is achieved by equipping your website with a professionally designed user-interface and well-written content with plenty of calls-to-action. As you can see, the ultimate goal of your website, and all your marketing efforts driving traffic to it, is to increase your sales and leads. This is why having a website-first marketing strategy is so important. If your website isn’t enhancing your brand, building value in your products or services, and enhancing user experience by providing visitors with relevant and useful content that will facilitate conversions, you’re working against yourself and your time and money invested in traffic-driving marketing efforts are for naught. If you’d like to find out how OffWhite can increase your leads and sales by working with your current website or helping you create a new one, contact us today.